Mainland China actress, Huo Si Yan (霍思燕) attended Louis Vuitton Store Opening, Ribbon Cutting Ceremony in Nanning, Southern China on December 11, 2010. 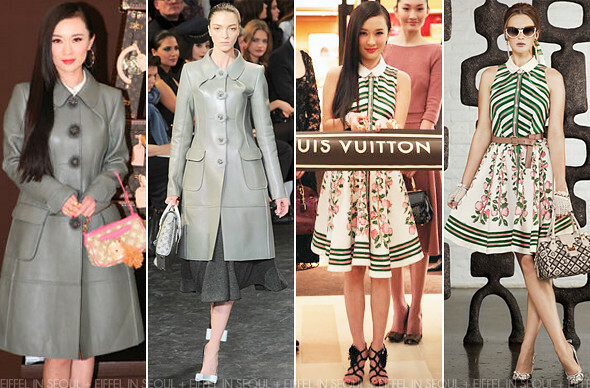 The actress was dressed in Louis Vuitton grey leather coat from Fall/Winter 2010 collection. She wore a Resort 2011 dress underneath the coat, completing the look with black sandals, pink Louis Vuitton bag and gold accessories. I adore the dress on her, it suits her style. However I dislike the sandals she chose, it would be great if she chose the pumps seen on the lookbook or the bow pumps from Fall/Winter 2010. Not long ago, Huo Si Yan (霍思燕) was also given the "Red Carpet Best Dressed" Award in Shanghai.